you can get the best results based on your needs. And in order to identify your needs, we're going to go through a series of questions. world to help to find the best path for them to achieve their goals. And I believe, if you follow these steps, you will be able to do the same thing. make some notes for yourself. Okay? the next step is in order to achieve your English learning goals. Okay? And also, what are the best strategies that you can use to get there. Okay? Now, I know that sounds pretty obvious, like: "Why? to get more real reasons. Why is the "Why?" of our life important? To help you take this journey. Okay? "Why am I doing all of this?" First somebody might say to me: "Well, I'm learning English for my job." Why are you learning English for your job?" -"To get a better job." -"Why are you trying to get a better job?" -"Why are you trying to earn more money?" -"Because I have to provide for my family." -"Why do you have to provide for your family?" They're the most important thing in the world with... to me." Okay, now we found the real reason. your family who you love with all your heart. So ask yourself these questions, okay? Because nobody has to do anything; we choose to do something. Find your: "Why?" and you will have the strongest motivation to achieve your goals. So, now, more specifically, let's look at some of the "Whys" that people have usually. Let's suppose you're trying to get into university. Why is it important to know that? Because the "Why?" is also going to determine the "What?" What you need to study. Is it to get into university? If so, then you need to focus on academic English. And that's actually an entire field of English language learning. It's called English for academic purposes. who have experience in those areas. Because your needs are very specific. Right? understand lectures, to read textbooks with lots of technical vocabulary. Let's suppose your "Why?" is an exam, you need to pass an exam. strategy is completely different. Right? From somebody else, because these exams are like a world in themselves. but not just in general, but for that exam. which prepares you for the exam, which is very different from just general English learning. And that's another area where you will need specialized training. Okay? needs and so many different areas. presentations, do you need to entertain clients or talk to them on the telephone? in a particular area it's because they lose focus. No, it's not just that. A perfect email, but an excellent email as far as I'm concerned." Okay? Or: "I need to make sure that I can give that presentation and really nail it." So when you identify that, presentation English is very specific. and trainers who will work with you to optimize your presentations. Such as myself, I do that all the time. preparing for their PhD or something like that. Okay? And various situations where that's a very specific skill. Okay? design the right, training program or trainer for you. Okay? which is called actually "English for Specific Purposes". for Engineers, all kinds of detailed professions have their own textbooks. And you may be able to find a trainer who has actually specialized in this area. So that's something else to keep in mind. What your real needs are. Next, maybe it's not about this. Maybe you're learning English for social purposes or for personal reasons. You want to make more friends, you want to travel, or for cultural reasons. person and enjoy more of English life, then your kind of English is going to be different. The English that you need to focus on. It's a little bit more conversational, more general. And also the resources that you're going to use are going to be quite different. Your whole strategy will be completely different. For example, what do I mean by that? When do you need to achieve a specific result? in a month or two months, or even next week. So, do you have a short deadline? Do you need to appear for an exam very soon? Or do you have a longer deadline? Okay? Is it something you must do urgently or do you have time? And also, what kind of time do you have available to devote to this goal? Are you able to work on it full time? Are you a younger person who can spend a lot of time on it? work on it on the weekends or only in the evenings, or only 15 minutes a day? Whatever it is, identify that answer for you. Okay? It will help you to design a program that you can stick with. to it, it's not going to help you. Okay? Now, the other point is: "Where?" Where do you want to study English? Okay? Are you looking to study locally? Okay? or in England, or Australia? Or are you ready to study online? This is how I do most of my training. a trainer online or a program online. is it possible for you to study? Can you leave your country? Do you need to leave your country? Is it the best option?" in on what you really need. 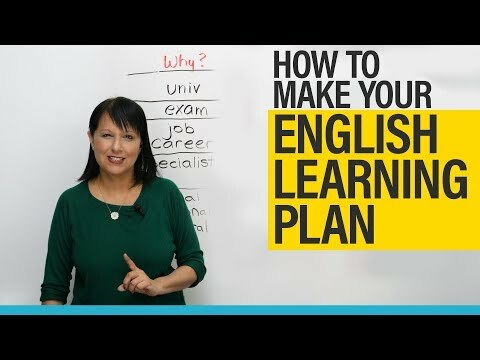 How much money do you have available for this purpose of improving your English? Are you going to go with the free option? Where you perhaps do not really have a budget for that but you still want to improve? Or are you going to be looking at some paid options? Or, of course, you can always look at a combination of those. So let's see how your budget affects some of your options. So then we come to the: "How?" In a group or a school? Or with a private teacher or trainer? These are some of the main options that people choose. So, what are some of the things you can do alone? You can do a lot alone, especially today. so you know that you can do a lot of English language learning online. So, of course you can go online, watch engVid, as I said. You can also watch lots of other things. Okay? you can watch movies, you can play games, you can download apps, you can read books. And from each of these you can learn something different. Okay? So much vocabulary you can pick up. You can learn about accent, you can learn how to speak well. and that's a great, fun way to improve your English. actually using both parts of your brain and you can learn really easily? your English, and also sometimes your grammar, depending on what you're listening to. Okay? And your accent as well. When you're watching something, sit down with your notebook. Write down the words, write down the expressions that your favourite actors sing. Write down a phrase and a song that you want to try to use yourself. There are a couple of things to keep in mind. very tough to improve by yourself. need to speak; and for writing, you need someone to evaluate your writing and give you feedback. a shame, and that's kind of a waste of time, and time is also money. And now let's look at what happens, then, when we go to some of the paid options. So one option is to join a group or a school, a language school, all right? world, which specialize in ESL students. per hour, so they cost less money. You're going to make general progress because you're part of a group. be 14 people in your class, or 24 people in your class. It depends on the time of year, it depends on the school, lots of things. You're not going to get as much attention. speaking per hour it costs more money. like it costs more money. But what is the advantage with a private teacher? You're going to make very specific progress. Okay? Teacher can't give you that kind of attention. and the teacher can't help you in that context. So maybe you'll do a combination of this. with you specifically on your writing, or on your speaking, or whatever your challenge is. Okay? You're going to achieve your goals faster, it's going to take less time. Okay? that experience, out of that money, out of that investment of time and money. challenge, that teacher or trainer could be the answer to your prayers. and the private teacher, and the solo options. It'll keep changing based on whatever you need or wherever you're at. It also depends where you are today in terms of your level. If you're a beginner, intermediate, you're probably going to start here. to that other option. Okay? Also, with the paid option, remember sometimes it's coming out of your pocket. to, so check that out. your company does as well. exactly you need and what's the best plan for you to follow to achieve your goals. Remember, we've looked at the: "Why? What? Where? When? How much? How? And with whom?" to the best solution for your situation and your reality. Now, if you've found this lesson helpful, please subscribe to my YouTube channel. If you're interested in working with me, you can contact me there. So, once again, thank you so much for watching. I really admire your determination. I'm sure you can do it, too. All right? So, as always, bye for now and all the best with your English. Speak like a Manager: Verbs 1 Master AT, ON, IN with the TRIANGLE method No more mistakes with MODALS! 3 Easy Rules IELTS General: Writing Task 1 – 14 Top Tips! Vocabulary Hack: Sound smarter and avoid mistakes Easy English Expressions with "OUT OF" The 10 WORST English mistakes you're making! Speak English Naturally: My pronunciation secret for difficult words Advance your English with 7 INTENSIFIERS "WHAT" or "WHICH"? Learn how to choose!